Excellent results without damaging the clothes. STAIN OFF1: Facilitates the removal of vegetal and animal grease dirt, makeup and similar stains. Excellent results without damaging the clothes. STAIN OFF2: Facilitates the removal of ink stains (pen, marker, paint and similar). STAIN OFF3: Facilitates the removal of rust stains. 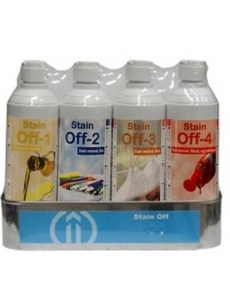 STAIN OFF4: Facilitates the removal of stubborn protein-based stains such as blood, egg, sauces and similar.